By Terry Miesle - copyright © 1999. 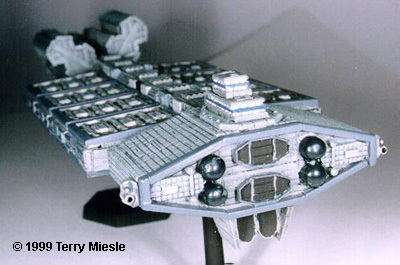 This is the big stick of the Earth Alliance - a fleet carrier armed with 18 squadrons of fighters. Definitely not something you want to meet ina dark and lonely corner of space. 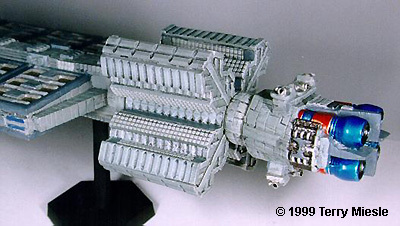 Except that the mini is much larger, buildup and painting information is exactly the same as for the other EA ships. Look at the Omega and follow the same techniques. The only place I deviated from this is in the hanger area, where TMM Steel was used to paint the recessed areas, with TA greys as fill, and TA Gunship grey as framing. This was drybrushed with TMM Medium Grey. Other than that, it's exactly like the Omega or Nova. Agents of Gaming (AoG) continues to release pewter game figures in support of their Babylon 5 Wars game system. Currently these are the only licensed B5 models in production. While small, the B5 minis are accurate and a lot of fun to build and paint. One of the longer awaited figures is the B5 station itself. While the Revel-Monogram model is close to the same scale as the AoG capital ships, this mini is not; it's a shade under 4 inches long. The mini comes in 13 parts: 2 Main body halves, 1 aft reactor section, 2 solar panels with 3 molded-in panels, 6 separate panels, 1 fore section (ball), and 1 above cargo section. Fit was good on my copy, with little filing needed. I did have to manipulate some of the parts to achieve correct fit. This is not unusual for metal minis, and is nothing out of the ordinary here. The two main body halves were glued together, and the joint cleaned up. The aft reactor section was glued in place right away. I glued the loose solar panels to their support structure, but did not glue any other pieces together – painting would be much easier in pieces. The entire mini was primed with Tamiya Sky Grey XF-19. Atop this the primary light blue pattern was hand painted with Testor’s Acryl (TA) U.S. Navy Blue (intermediate) AN00485. Then I painted over this light blue with successive shades of Gunze-Sangyo (GS) Clear Smoke Blue H96. This let me apply subtle shading to mimic the patterning evident on the station. I used this blue among other panels, to apply borders along the blue sections, providing depth. I used a similar technique with the gray shades, but had to rely on several shades of gray, not clear paints. These shades were all GS acrylic paints: H315, H337 and H317 grays. These shades were used to apply borders, panels and trim colors. The darker grey was also used to provide a sense of depth on the ball section. The red on the forward ball-shaped section is Tamiya Clear Red X27. These clear paints are a joy to work with, they hand-paint very smoothly, and can be applied in layers for patterning. The aft reactor section uses Testor’s Model Master (TMM) Steel, Gunmetal and Aluminum. Then I applied a topcoat with Testor’s Copper paint. The solar panels interiors were painted with TMM Chrome Silver, then overpainted with Tamiya Clear Blue X23. The border color is TA Gunship Gray. The cargo section which runs the length of the rotating section was painted with various shades of grey and metallic paints already mentioned, along with Tamiya’s flat red. I knew I needed a very subtle wash to bring out some details. First I applied diluted Future Floor Wax as a sealant. Flat paints can absorb too much color during a wash. I used my standard black wash of diluted TMM Flat Black in several coats, targeted to flow into the scribed lines and recesses. Excess was removed with a solvent-moistened cotton swab. After the wash, the model (with the exception of the aft reactor section and solar panels) was sprayed with GS Flat Clear Coat. Some metallic details were brought out after dullcoat as well. Then I assembled the pieces and mounted the stands. One note: I noticed in the pictures some irregularity in the solar panel colors. I used a Micron Black disposable drafting pen to frame the color, but was unable to take more photos for reasons I'll discuss below. I was contacted by AoG to paint this mini and the Poseidon carrier for box art photos. As it turned out, I only had a week to complete it. We didn't know that when I received the pieces, but I did just barely get finished. In that light, I'm happy with the paint work. I continue to be impressed with AoG's sculpting and casting work with their recent minis as well. If you're up for the challenge of subtle shading, then this is a kit for you. For you scale buffs, this kit works out to something like 1/55,000. This page made possible by Starship Modeler - copyright © 1997-8.